Christened Nazaria Taylor better known as Dj Naz, is a women empowering selectress, representing music at its best the same way any male can adding that "Gurlpower" touch. Naz comes from a strong line of musical icons, being the daughter of Don Taylor, the former manager of Bob Marley and mother Joy White, who is popularly known for her hit song First Cut, which was produced by Donovan Germaine of Penthouse Records. She was the lone female DJ in the exciting 2009 Heineken Green Synergy competition. Since 2009 her skills on the turntables have grown tremendously. She re-entered Green Synergy in the year 2010 where she placed third. For a female to enter such a competition and be in the top 3 twice, it is considered a huge accomplishment. Dj Naz didn’t stop at Green Synergy; in summer of 2011 she entered the 45 Boom competition for Fully Loaded. Many persons weren’t sure of her capabilities as a clash selector on a stage such as Fully Loaded. DJ Steadily progressed through the rounds and became the winner of the competition. 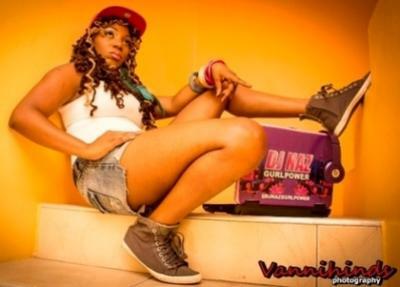 She is presently one of the most sought after deejay in Jamaica, for night clubs, dancehall sessions and parties. Dj Naz has emerged as a bonafide disc jockey who is ready to show the world what she can do. Naz said "Dj such as Dj Sunshine, Kurt Riley, Collin Hines and Dj Shorty are some of whom she admires in the business. I love dancing and I just cannot take the fact that I cannot dance anymore. My knee cap broke and I am confined to my wheelchair for the rest of my life. I hope you guys make up the best days of your life. Live your life with all you can.